Exercise is important for kids of all ages but in order for them to have the required energy for active play, children must be fed a well-balanced diet, rich in nutrients. All parents know that fatty and sugary foods are not the best choices for kids, but it can be hard to know exactly what to feed children for maximum health and energy. While no specific foods need to be completely off-limits, sweets and other nutritionally poor choices should be fed to children only on rare occasions. There is nothing wrong with a frosting topped cupcake for a birthday celebration, but such items should not be everyday snacks. Fried foods, fast food, and other forms of "junk food" should also be avoided, which is probably obvious to most parents. Even some foods and beverages that parents may think of as healthy are, in reality, not that great from a nutritional standpoint. Fruit juices are often favoured by kids, but they are high in calories while offering very little in the way of nutrition. It is far better to offer kids milk or water to drink, with fruit juice being served only occasionally and in small servings. "White" foods are not great choices, with whole grains preferred. In general, the more processed the food, the less likely it is to be healthful. Many parents believe that healthy selections won't appeal to their children, but there are a number of foods that kids like and meet parental approval. Kids often prefer basic foods with very little seasonings, so when planning meals and snacks, parents will have better luck convincing their kids to eat if they keep the menu simple. Fresh fruit is a time-honored kid pleaser and can help kids to meet their recommended "5 a Day" of fruits and vegetables. Most all fruits and veggies count (except for potatoes, which are considered a starchy food), and portion sizes are reasonable, so getting the required amounts isn't hard to do. Variety matters, though, so kids need to be encouraged to try many different types of fresh foods. While fruit is popular, it can sometimes be difficult to sell kids on vegetables, but parents can incorporate veggies into soups and stews, making them more palatable for many kids. Many parents make the mistake of feeding their children highly processed white bread, assuming that children will prefer its gummy softness over the heartier varieties, but processing takes much of the value of the grains away, making white bread a poor nutritional choice. Children who are introduced to whole grain breads at an early age will readily accept them and even older kids can make the adjustment to whole grain varieties if the transition is made slowly. 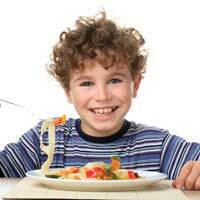 Pasta is also a great source of energy producing carbohydrates, and very few children object to eating it. When whole grain pasta is topped with a tomato based sauce, you have a meal that both parents and kids will enjoy. Other great grain choices include brown rice, unsweetened or lightly sweetened cereals, and popcorn. Kids should be encouraged to drink milk -- low fat for children over two years of age and nonfat for older kids and teens. While most children enjoy milk, some find it objectionable or suffer from lactose intolerance. For those children, low-fat soy milk may be preferable, with a variety of flavours available, making it popular with kids and their parents. Yoghurt is another good choice for children, but parents should steer clear of the heavily sweetened varieties, instead adding fresh fruit for added sweetness. Protein is important for building muscle tissue, vital for active kids and teens. There are nine amino acids that our bodies need, but cannot produce, requiring that we get them from our food. Animal sources, including eggs, meats, poultry, and fish contain all nine amino acids, but it is important for parents to choose lean cuts of meat for their family's diets. It's important for parents to remember that they are helping their children to establish long term eating habits, so they should encourage their kids to develop a taste for lean, healthy protein sources. Egg dishes usually appeal to children, they are inexpensive, and easy to prepare, making them ideal choices for quick family meals. Beans, grains, nuts, and seeds also provide protein, with none of the saturated fat found in meat. Baked beans provide kids with quality protein and are also a great source of fibre. Active children need to eat often to keep their energy level high. Typically, kids don't eat a great deal at one sitting, but instead prefer to eat small meals and snacks throughout the day. Snacking has a bit of an undeserved bad reputation, but this is largely due to the fact that many parents associate snacking with low quality, "junk food." Wholesome snacks of fresh produce, whole grain toast or crackers, yoghurt, or other nutritious foods can help kids to maintain their stamina throughout the day, keeping them happily active. Finally, it is important for children to stay properly hydrated if they are to feel and function their best. Kids should learn to drink before they feel thirsty and should take in additional liquids both during and after working out or playing actively. Plain, clear water is the best choice for hydration, but not all children are willing to drink enough water. Water mixed with a splash of fruit juice (unsweetened, of course) can make a beverage that is appealing to most children. Five A Day: What Does it Mean for Kids? Should Kids Drink Water When Exercising? Fun Facts: How Many Calories Does Exercise Use?